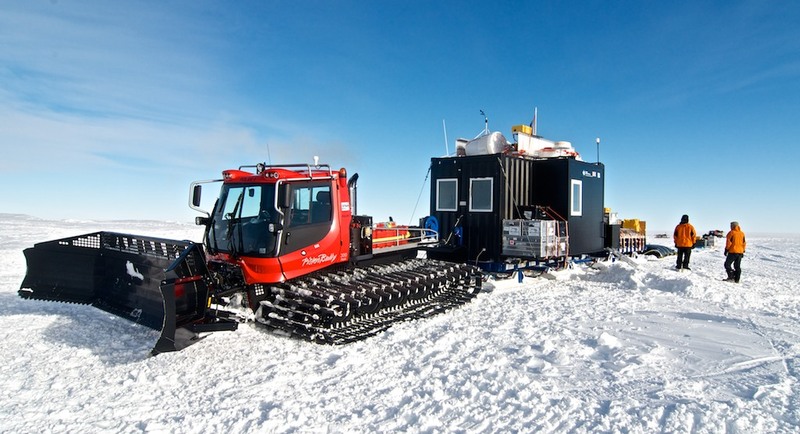 A typical iSTAR field camp with the living ‘caboose’ on the left (credit: Damon Davies). It’s the 2nd December 2013 and I find myself in one of those rare occasions in life where I feel I need to pinch myself to see if I’m dreaming. Why? Somehow I’m in control of a British Antarctic Survey De Havilland Twin Otter aircraft flying over the white featureless expanse of the West Antarctic Ice Sheet. I’m part of a team of 12 heading to Pine Island Glacier, a remote ice stream 75°S and around 1500 km from Rothera Research Station on the Antarctic Peninsula. The journey so far has taken four flights from London to Punta Arenas on the Southern tip of Chile and across the Drake Passage to Earth’s southernmost continent. Our pilot, John is having some lunch and keeping a close eye on my erratic attempts to hold a constant bearing and altitude as I ‘co-pilot’ the final leg of our journey. 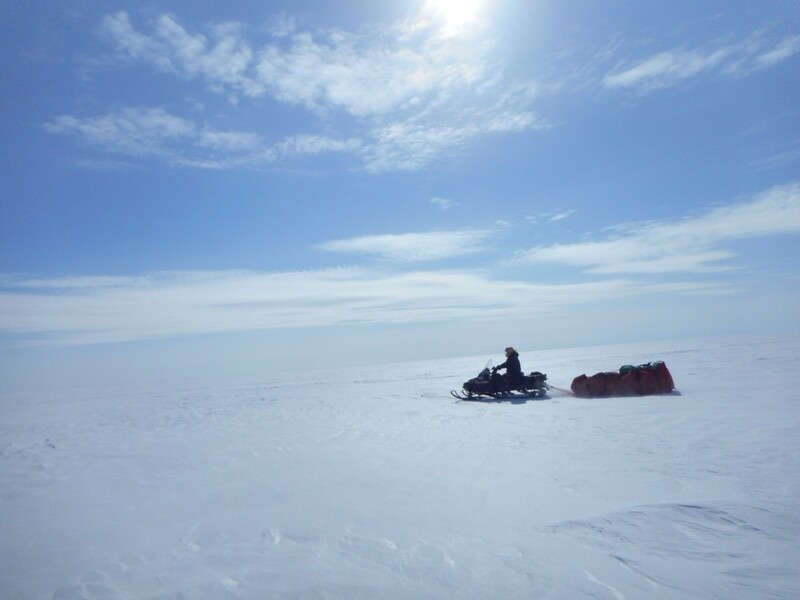 On the horizon I spot a thin strip of bright white snow that marks the groomed ski-way of our landing site. John takes back the controls and eases the throttle down for a perfectly smooth landing. I step down from the plane with a familiar squeak and crunch of cold dry snow underfoot in an unfamiliar environment like nothing I’ve experienced before. I squint as my eyes adjust to the bright white desert of flat ice sharply contrasted by a crystal clear blue sky spanning the distant horizon in every direction. This will be my home for the next few months as I embark on my first Antarctic field season as part of the first iSTAR science traverse of Pine Island Glacier. 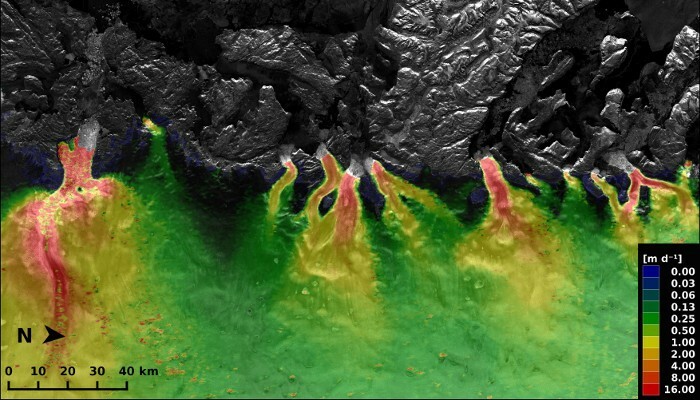 iSTAR (ice sheet stability and research programme) is a £7.4 million research programme funded by the UK Natural Environment Research Council (NERC) involving 11 UK universities and the British Antarctic Survey (BAS). Its aim is to improve understanding of ice-ocean interaction and ice dynamic response of Amundsen Sea sector of the West Antarctic. Over the past few decades this region has been undergoing the greatest rates of ice loss on the planet causing concern over its potential future contribution to rising global sea-level. 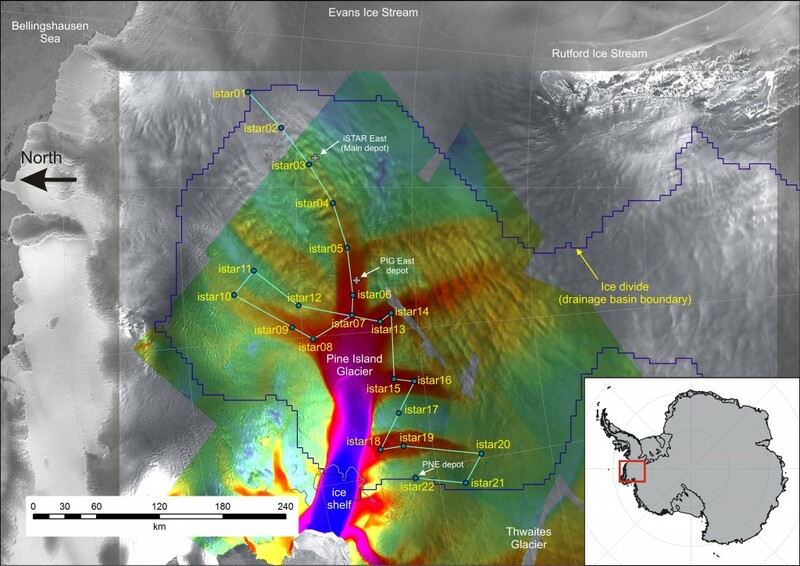 Pine Island Glacier (PIG) drains around 10% of the West Antarctic Ice sheet (WAIS) which contains enough ice if melted to raise global sea-level by approximately 3.3 metres. In order to make accurate predictions about how this region will respond to environmental change requires good physical observations and measurements. 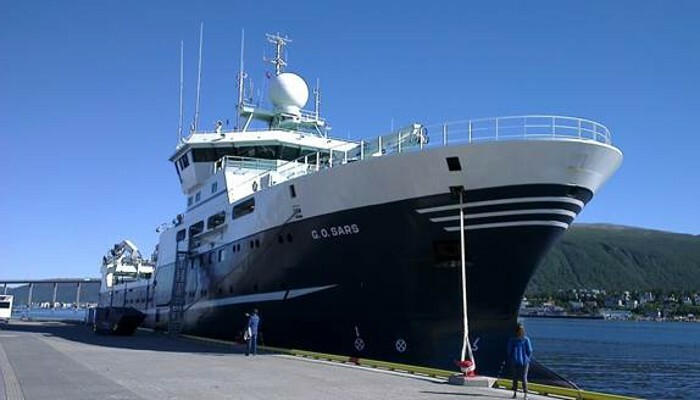 Through scientific ocean cruises and an over-ice traverse spanning two field seasons combined with satellite remote sensing and numerical modelling, iSTAR aims to provide the data necessary to improve the accuracy of projections for the contribution of the WAIS to future sea level. 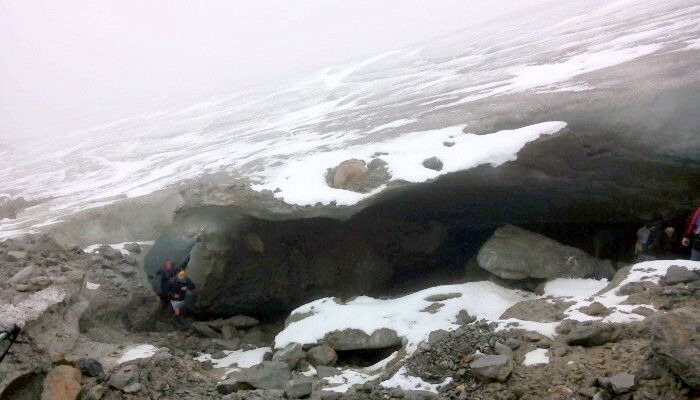 Traditionally the UK has conducted glaciological investigations in remote regions of Antarctica using small field units typically consisting of one scientist and a field assistant. For larger drilling projects equipment has to be flown by aircraft at great expense and fuel consumption. For iSTAR, a new approach was undertaken using two ‘tractor trains’. 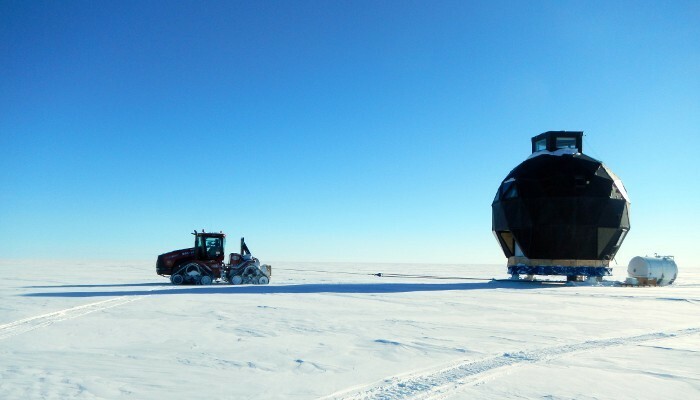 These consist of two Pisten Bully snow tractors towing two long poly sleds with fuel bladders and three metal cargo sledges including a living ‘caboose’; a converted shipping container with a cooking and living space (essentially a caravan fit for polar travel!). 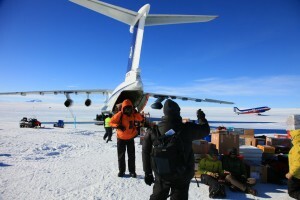 All this equipment was delivered by the RRS Ernest Shackleton to the Abbot Ice Shelf in February 2012 and driven to Pine Island Glacier ready for the first traverse the following season. iSTAR tractor train (credit: Alex Taylor). This infrastructure provided a means to meet the ambitious science aims of the iSTAR traverse making it possible to collect more ground measurements over a wider area than ever previously possible and with greater fuel efficiency. 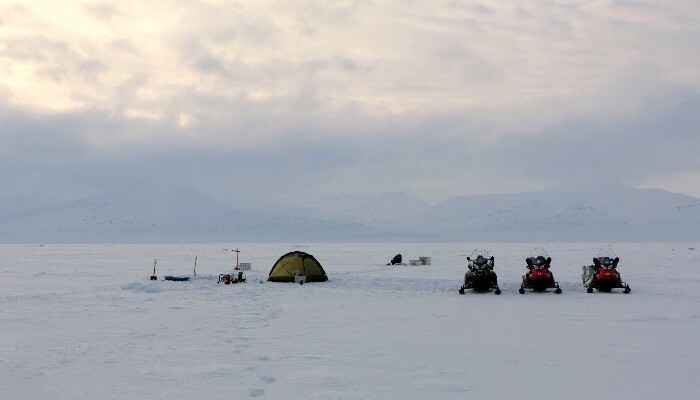 The traverse follows a 900 km route visiting the trunks and tributaries of PIG to conduct a range of measurements on the ice. 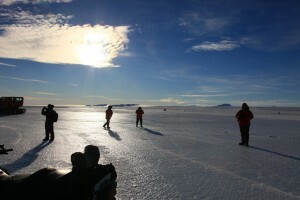 The route of the iSTAR traverse of Pine Island Glacier, West Antarctica (credit: www.istar.ac.uk). 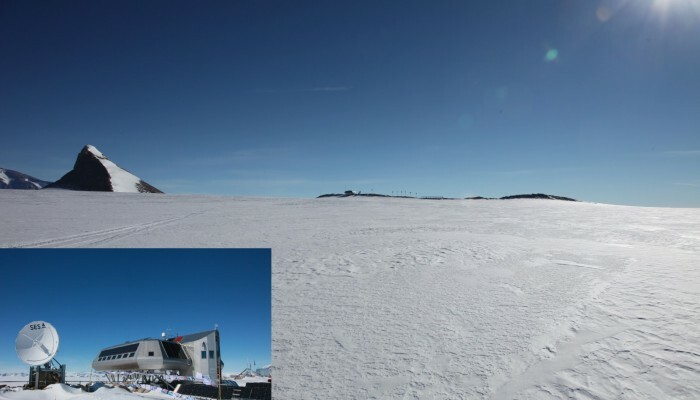 The iSTAR programme is split into four science projects, with iSTAR A and B making measurements from scientific ships and iSTAR C and D collecting data during the overland traverse of Pine Island Glacier. It is the overland traverse that we were involved in. 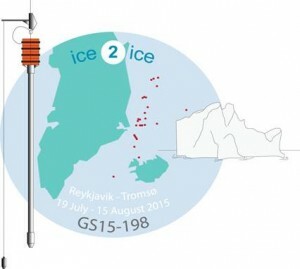 This project aims to understand the internal dynamic processes responsible for transmitting the effect of thinning of PIG’s floating ice shelf caused by melting of warm ocean currents upstream into the trunk and tributaries of the ice stream. Of particular interest is how the underlying geology of the ice influences its flow. 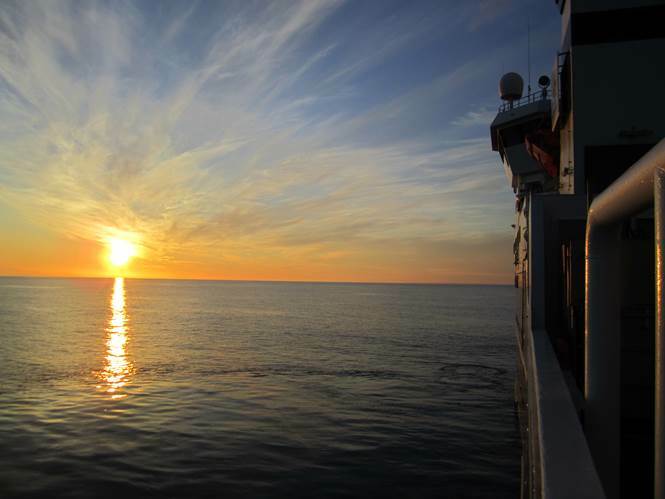 Over the course of two field seasons the traverse collected over 2000 km of radar data and over 40 km of seismic surveys were completed. 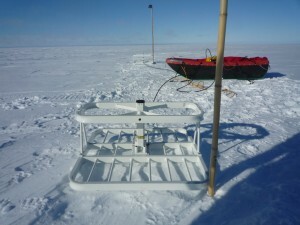 The team used skidoos to tow radar equipment across the ice making the most of the 24 hours of daylight of the Antarctic Summer to provide detailed images of the ice thickness and bed topography. 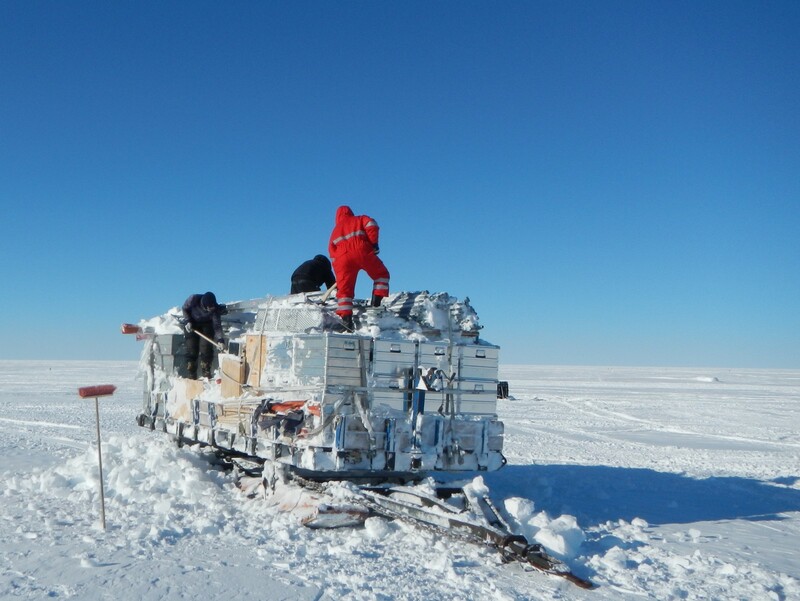 The geology of the subsurface was also investigated by analysing the seismic energy returned from small explosive charges buried in the surface of the ice. Operating the ice penetrating radar (left) and firing explosives for seismic surveys (right) (credit: Damon Davies). Satellite measurements over the past two decades have revealed rapid thinning (up to 1.5 metres per year) and acceleration of PIG’s ice flow. 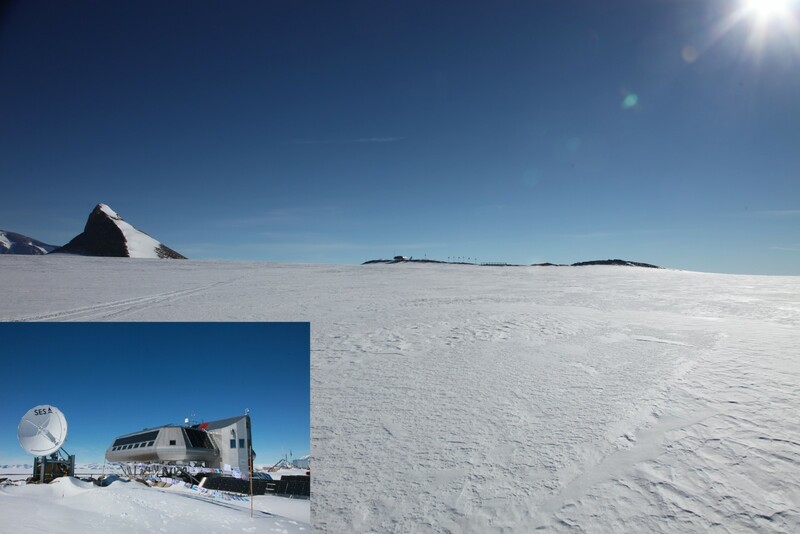 The iSTAR D project aims to take measurements to extend the record of past snow accumulation and ice density to improve estimates of ice loss that cannot be determined from satellite measurements. 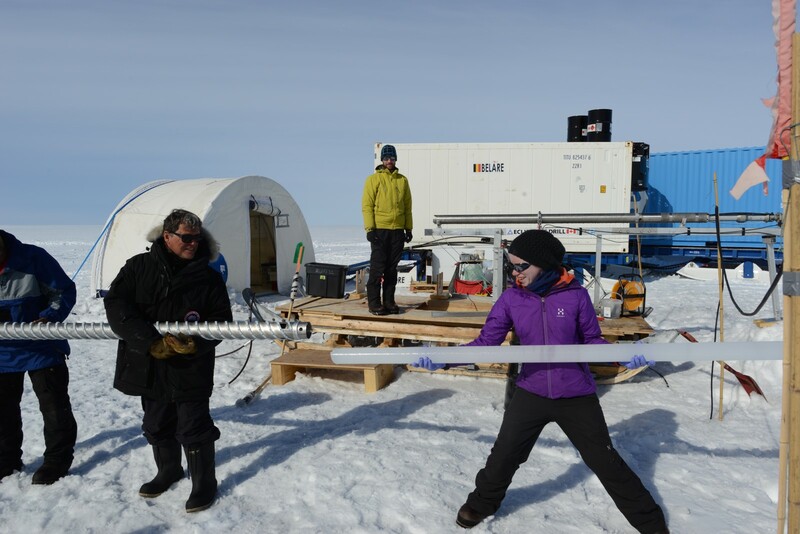 To determine past accumulation and understand surface processes such as snow density changes and compaction, we drilled 10 shallow (50 metre) ice cores. These ice cores had to be kept frozen and shipped back to the UK where their chemistry is being analysed to enable us to quantify how much snow has fallen onto the ice sheet in the past. 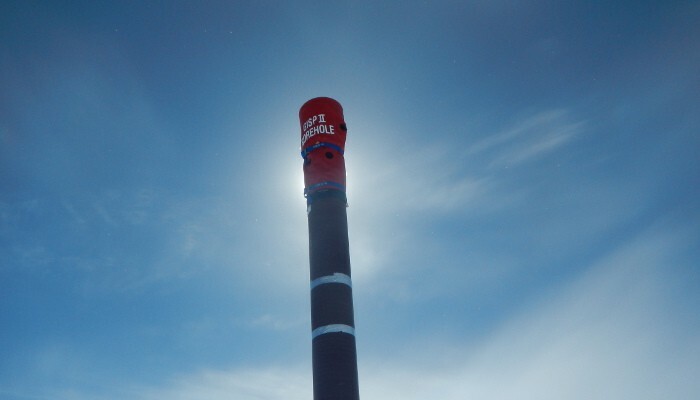 Over 20 snow density profiles were recorded using a device called a ‘Neutron Probe’ which uses a radioactive source to measure neutron scattering from within the snowpack to calculate ice density. This might sound dangerous but to my disappointment after spending many hours operating this equipment I have yet to develop super powers! Rob, Becky and Emma inside the ice core drilling tent (left), Damon and Andy working at a Neutron Probe site (right) (credit: Alex Taylor). Surface radars operating at the same frequency as satellites that orbit the earth measuring ice surface changes were also deployed. These ground radar measurements enable us to improve the accuracy of satellite derived estimations of ice volume loss from West Antarctica. Anna operating the surface radar (credit: Jan De Rydt). Now you know all about iSTAR science but what’s it like to live and work in one of the most remote regions of the coldest, highest, driest and windiest continent on Earth? 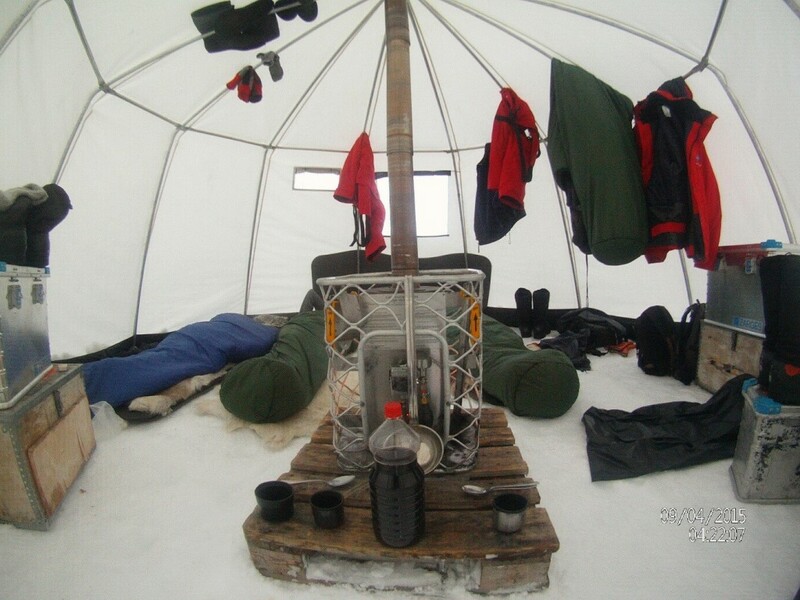 Life on the iSTAR traverse is perhaps similar to a travelling circus, only instead of jugglers and gymnasts we have scientists and mechanics and rather than a ‘Big Top’ we had the ice core drilling tent. 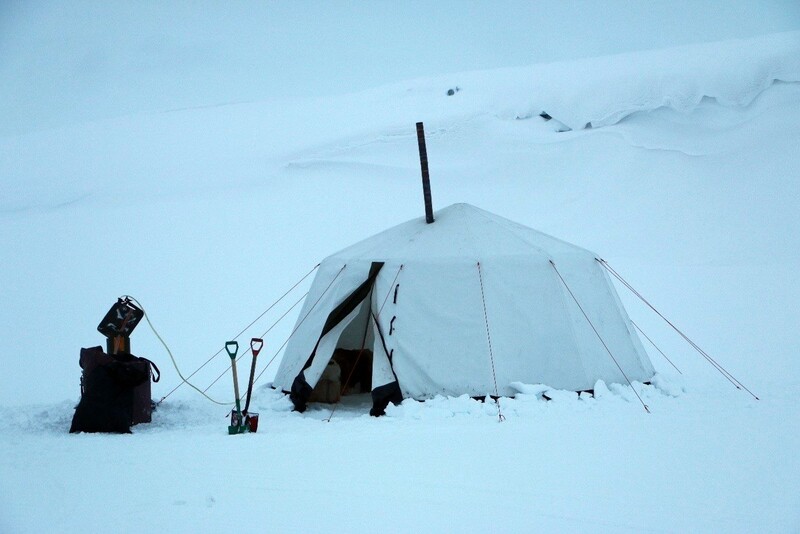 At each of the 22 sites on the traverse route the circus would set up camp for a few days to a week. Tents would be pitched, sledges un-hitched and science equipment unloaded, the whole process of setting up camp taking just an hour or two. Setting up the drilling tent (left). iSTAR accommodation (right) (credit: Alex Taylor). This region of Antarctica has a reputation for wild weather. Temperatures can drop below -30°C and winds can reach hurricane speeds reducing visibility to within a few metres. However, on calm days it can be so silent you can hear your own heartbeat and the strength of the summer sun provides welcome warmth. Good weather means working long hours as you never know how long it might last. When the weather takes a turn for the worse, all you can do is shelter from the elements and wait patiently for the storm to pass, though patience can be tested when the storm lasts for a week! iSTAR team members battling a storm (left) (credit: Alex Taylor). Tent damage after a big storm (right) (credit: Damon Davies). The living ‘caboose’ offers a warm shelter away from the elements. This is also where the team gathers at meal times with everyone taking turns to cook for the rest of the group. The iSTAR menu normally consists of a porridge breakfast, soup and bread for lunch, some form of carbohydrate with meat slop for dinner followed by tinned fruit/pudding with powdered custard for dessert. The labels of some meal packages such as ‘chicken own juice’ and ‘sausages in lard’ aren’t particularly enticing but generally the food is good by Antarctic field standards. 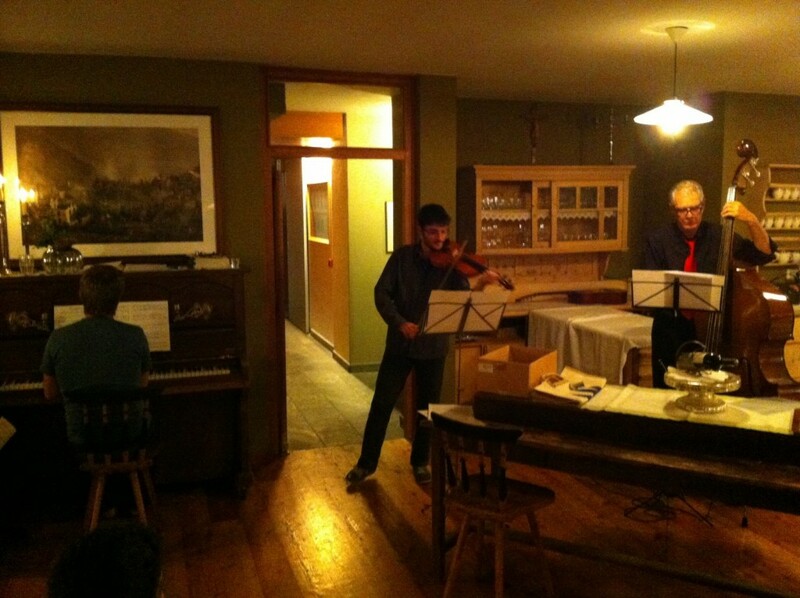 Dinner-time in the caboose (left) (credit: Alex Taylor). James finishing off a cottage pie with a blow torch (right) (credit: Damon Davies). 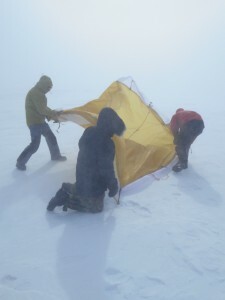 The iSTAR traverse was an incredible experience that allowed me to learn a range of data acquisition techniques as well as learning how to work in the often hostile Antarctic weather. 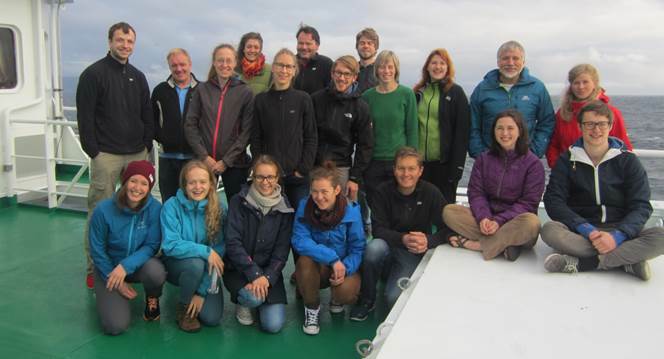 I was one of 9 PhD students and post-doctoral researchers involved in the traverse seasons who were able to work alongside highly experienced scientists in the field. 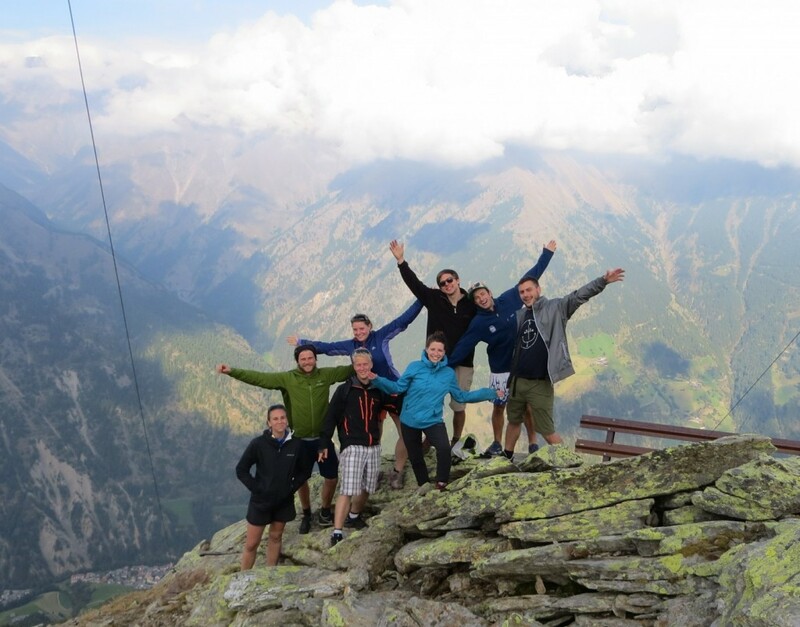 Our success is a testament to the hard work and good spirit of everyone involved. 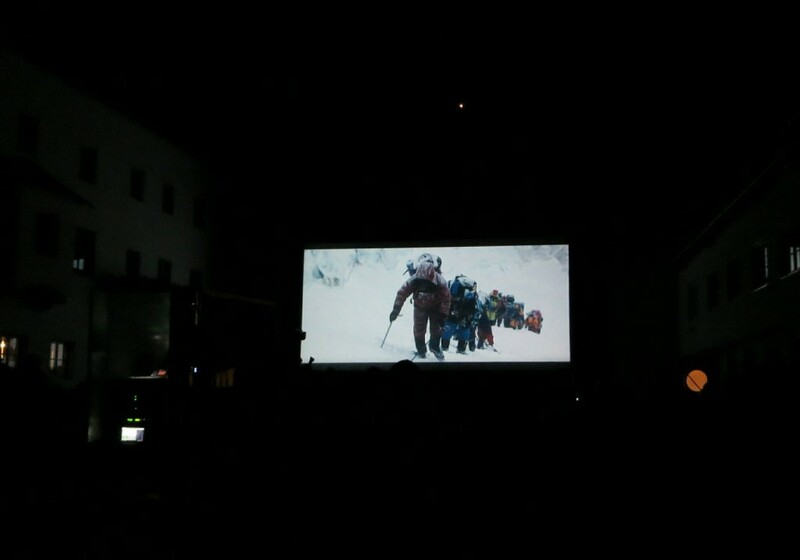 Left photo, 2013/14 traverse participants. Left to right, Anna Hogg (Leeds), Rob Bingham (Edinburgh), Andy Smith (BAS), Damon Davies (Edinburgh), Johnny Yates (back row, BAS), Tim Gee (middle, BAS), Jan De Rydt (front, BAS), Steph Cornford (Bristol), James Wake (BAS), Peter Lambert (Reading), Thomas Flament (front, Leeds), David Vaughan (BAS) (credit: David Vaughan). Right photo, 2014/15 traverse participants. Left to Right, James Wake (BAS), Mark Baird (BAS), Tim Gee (BAS), Emma Smith (BAS), Isabelle Nias (Bristol), Robert Mulvaney (BAS), Andy Smith (BAS), Alex Brisbourne (back row, BAS), Rebecca Tuckwell (middle, BAS), Alex Taylor (front, BAS), Sebastian Rosier (BAS), Damon Davies (Edinburgh) (credit: Alex Taylor). For more information about the iSTAR research programme visit www.istar.ac.uk and the ‘stories from the field’ blog posts to read more tales from traverse fieldwork. Acknowledgments: A huge thanks to James Wake, Tim Gee, Johnny Yates, Mark Baird and Alex Taylor for their tireless support in the field. 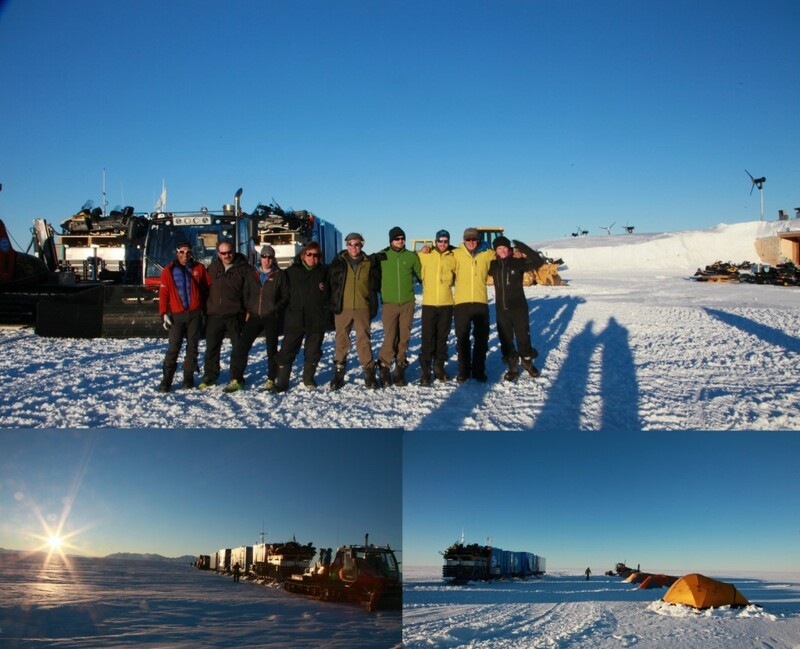 The traverse could not have succeeded without support from the staff at Rothera Research Station. Also thanks to Emma Smith for helpful comments on this blog. 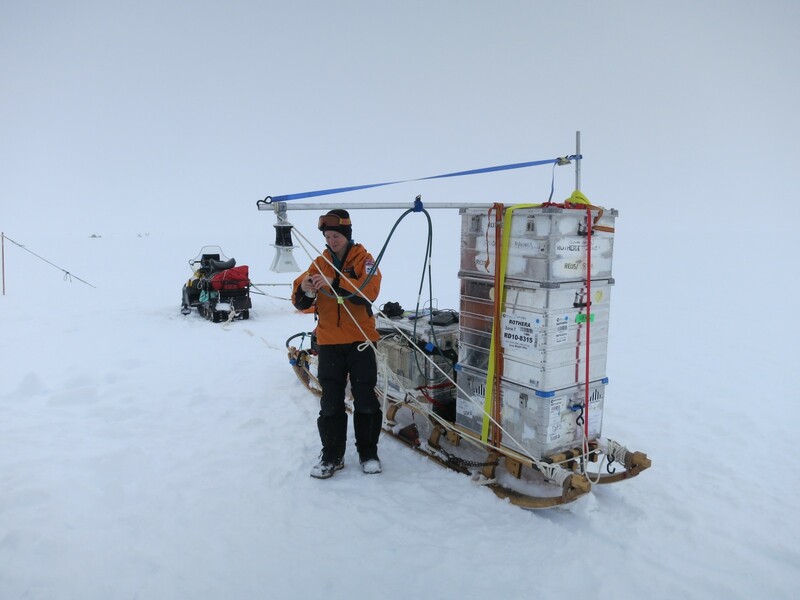 Damon Davies is a PhD researcher at the University of Edinburgh, School of Geosciences Glaciology and Cryosphere research group. His research uses geophysics to investigate the dynamics of ice stream beds and their control on ice stream flow. 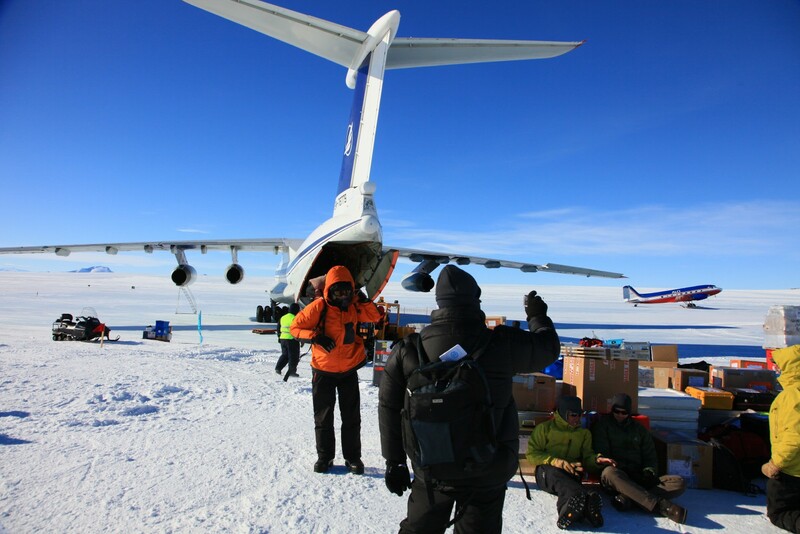 19 November 2014, the Iliuchine 76 gently lands on the runway of the Russian Antarctic station, Novolazarevskaya, in Dronning Maud Land. For the first time, I’m in Antarctica! 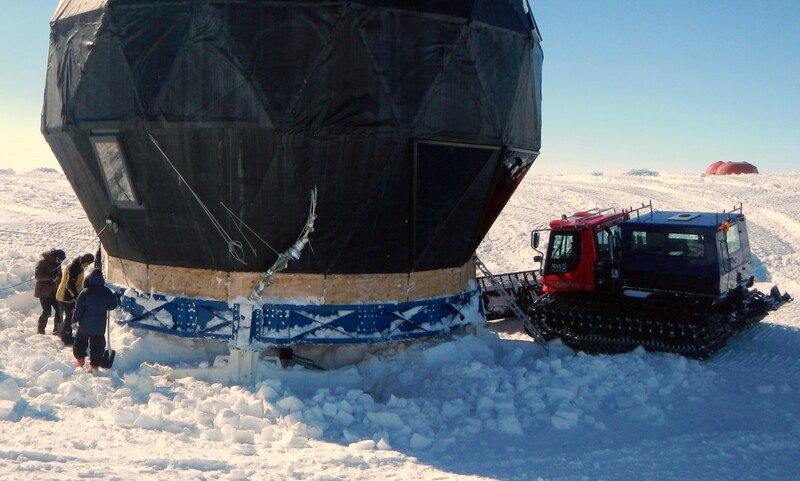 It is 4 o’clock in the morning and we need to hurriedly offload 2 tons of material intended for our field mission near the Belgian Princess Elisabeth Station. I’m deeply impressed by the landscape although it is dotted with containers, people and machines. I am impressed by the fuzz. I am impressed by the novelty. I am impressed by the icescape. It is cold, but I don’t feel it. I take part in an expedition lasting five weeks and led by the Laboratoire de Glaciologie of the Université Libre de Bruxelles (ULB) in the framework of the Icecon project.The project aims at constraining past and current mass changes of the Antarctic ice sheet in the coastal area of Dronning Maud Land (East Antarctica) to better understand past and present ice volumes and the extension of the Antarctic ice sheet across the continental shelf during the last glacial period. 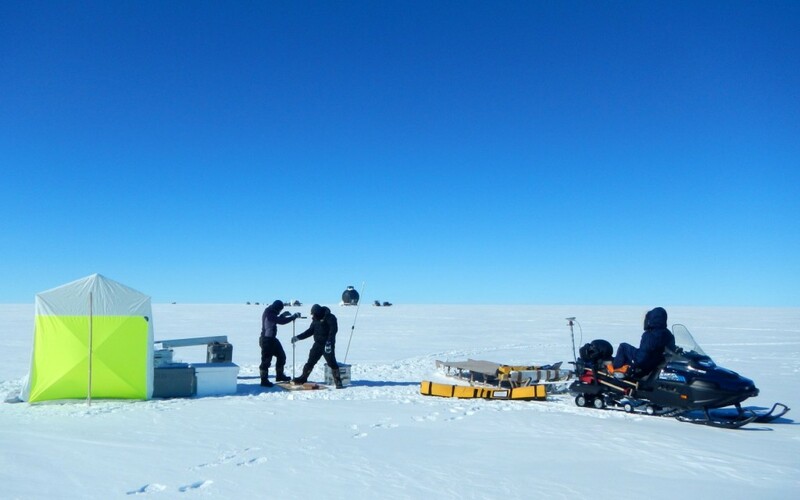 This year we are a team of 5 to do the job: GPS measurements, ice-core drilling, high- and low-frequency radar measurements (GSSI and ApRES), televiewer measurements … The ApRES radar is a new phase-sensitive radar developed by British Antarctic Survey (BAS), capable of detecting internal structures in the ice and changes in the position of internal layering over time. After a couple of hours at the Russian base, it’s time to fly to the Princess Elisabeth Station (the Belgium base, PEA). The arrival in a Bassler (a former DC3 re-equipped with turbo-props) with stunning views of the Sor Rondane Mountains and the Princess Elisabeth station on the Utsteinen rim is simply magnificent. Alain Hubert, the base manager, gives us the first security rules and shows us the different parts of the base. After following the various field training and especially an exercise that aims at pulling yourself out of crevasses, it’s time to inspect, to set up, and to test our equipment. 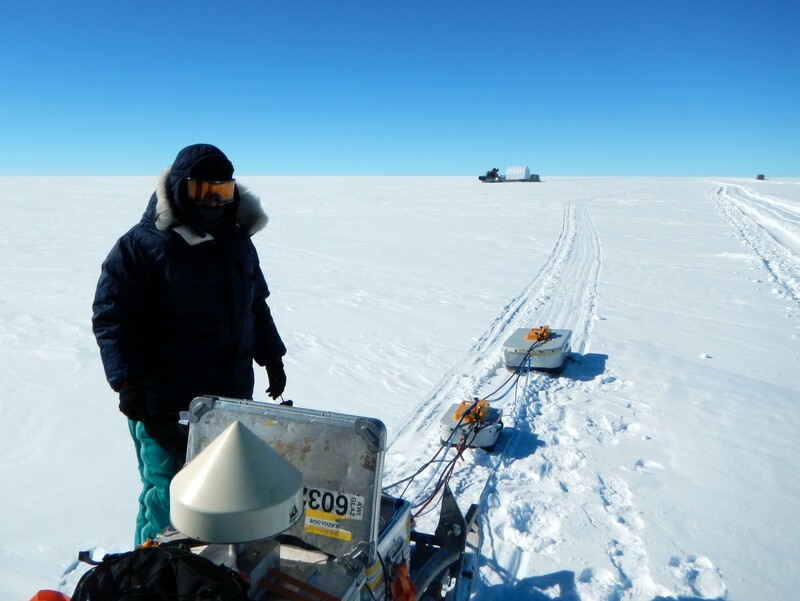 While one part of the team sets up the drill, Frank Pattyn and I test the GPS and radar equipment, mainly the ApRES that is a new “toy” for us. The first results are promising, we can clearly identify the bed topography and internal layers. The two GPS systems sponsored by the “10km of the ULB”, a run organised by the students of our Faculty, are also tested next to the L1L2 GPS systems for precise positioning. As our departure is imminent, I’m excited (even though my level of Coca-cola are getting low – I ‘m an avid consumer of this “evil drink” and Frank was afraid that I wouldn’t survive without sufficient sugar intake). On 27 November, we leave PEA in the evening for one night and one day across the Roi Baudouin Ice Shelf to Derwael ice rise. We are 6 scientists, 2 field guides and 1 technician. After 25 hours of travel, we set up the camp on the top of the divide. We start immediately with the radar measurements to locate potential drill sites. However, we get caught in a storm the following day and as Frank says “not a nice one”. The snow drift is just amazing and the atmospheric pressure drops frighteningly (“can this still go lower?”). The whiteboard installed in the living container is not wide enough to draw the graph of pressure change, nor is it high enough to accommodate the lowest values. Furthermore, it’s quite warm, meaning that snow melts in contact with persons and goods. 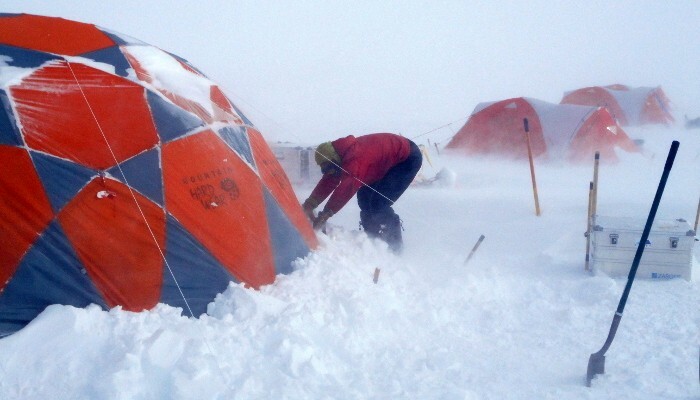 Despite efforts of everyone to clear away the snow, we leave our tents and sleep in the containers for 2 days. Not the most comfortable nights, because we share a two-bunk space with three people, and despite a container it remains very shaky! After three days of amazing experience, we clean up the camp and the science restarts. 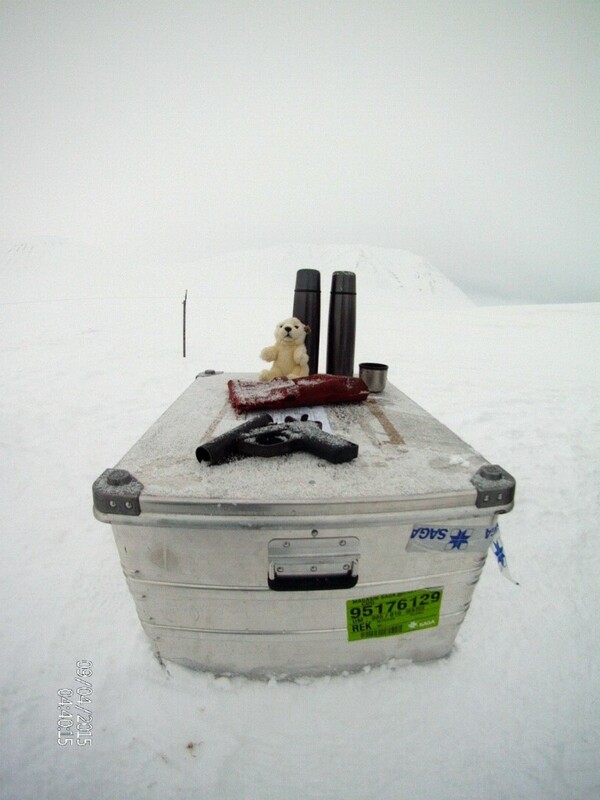 For one week Frank and I perform radar and GPS measurements in a 10km radius around the camp. These measurements will be repeated in 2015-2016 to provide new data on ice compaction, density and flow. While Frank thoroughly checks the collected data, I have some time to get familiar with the drill, which should prove to be very useful thereafter. 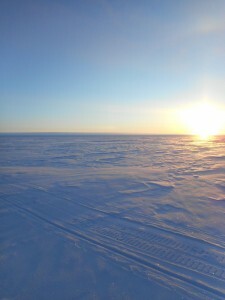 The “drill part” led by Jean-Louis Tison and Morgane Philippe aims at drilling two 30 m deep ice cores on Derwael Ice Rise, 2 km on each side of the divide. We want to investigate the spatial variability of snow accumulation induced by this ice rise that sticks approximately 300 m above the surrounding flat ice shelf and therefore perturbs the surface mass balance distribution (Lenaerts et al., 2014). 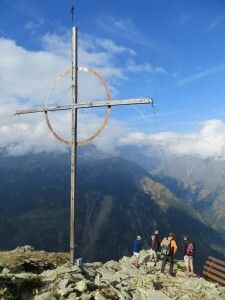 I use this week to improve my knowledge on other scientific techniques, such as the coffee-can method (will complement the results from the ApRES) or geodetic GPS measurements with Nicolas Bergeot. I also learn the basics of snowmobile mechanics (it’s surprising to see the amount of snow that can be put in an engine!). Unfortunately we get stuck for another 2 days by a new storm event. We use this time to have a look on the first radar profiles and to prepare the second part of the expedition. 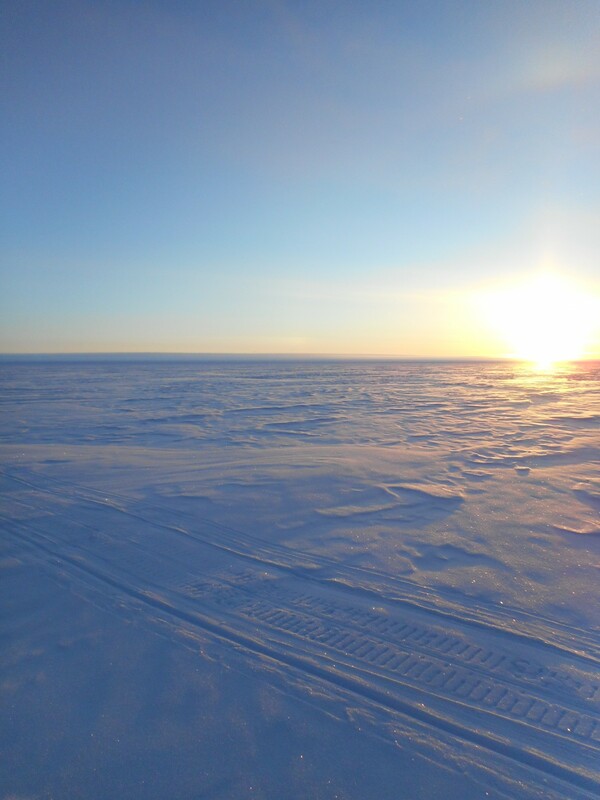 On 9 December, we leave the camp on Derwael ice rise and move towards the Roi Baudouin Ice Shelf, 40km to the west. We set up the camp in a longitudinal depression (like a trench) on the ice shelf that stretches from the grounding line to the coast. The purpose of this part of the field work is twofold: first of all, determine the mass budget of ice shelves. 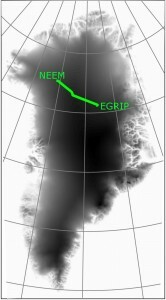 To do that, we need to map carefully the flow speed of the ice-shelf. Secondly, understand the formation of the trench in evaluating if under the ice-shelf, the ice is melting or accreting (formation of marine ice) and analyze the surface melt history by investigating near-surface melt layers. The first three days are devoted to make radar measurements (ApRES) in the center and on the sides of the trench. The thickness of ice and the reflection at the interface with the ocean is different from the one on the ice rise; we take some time to develop a robust method and determine the best settings of the radar. Together with Frank Pattyn and Jan Lenaerts (InBev Baillet Latour fellowship, http://benemelt.blogspot.be/) I perform a 120km transect with a high-frequency radar towed by a snowmobile to map the near-surface internal structure along the ice shelf and link the drill site with the grounding zone. Driving at 8 km per hour for 8 hours a day, it’s an opportunity for me to think about how lucky I am to be here. Alone in the vastness of the Roi Baudouin ice-shelf, I feel very small. Back in camp, we find out that the drill got stuck at a depth of 54m in the borehole and preparations to free the drill are on their way. 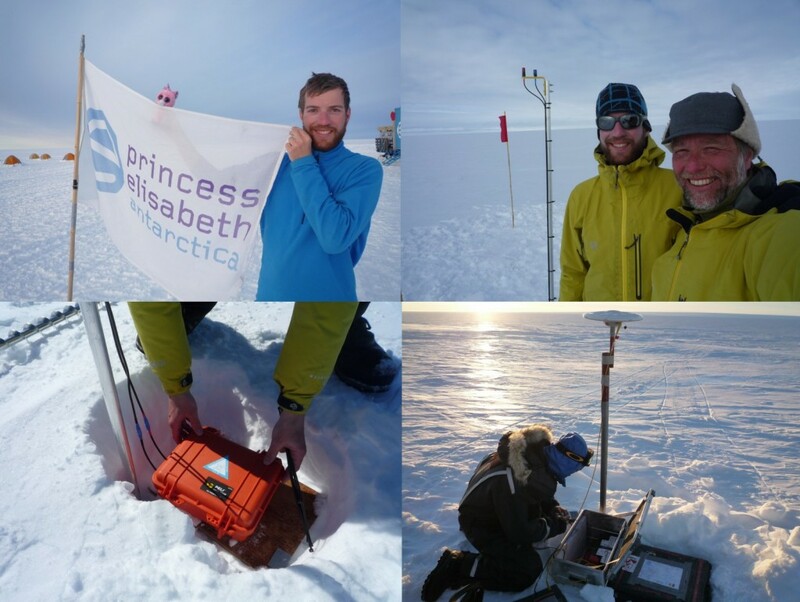 During this time I carry out a number of high-frequency radar measurements with Alain Hubert (the base manager) to fine-tune the equipment to potentially detect crevasses near the surface. 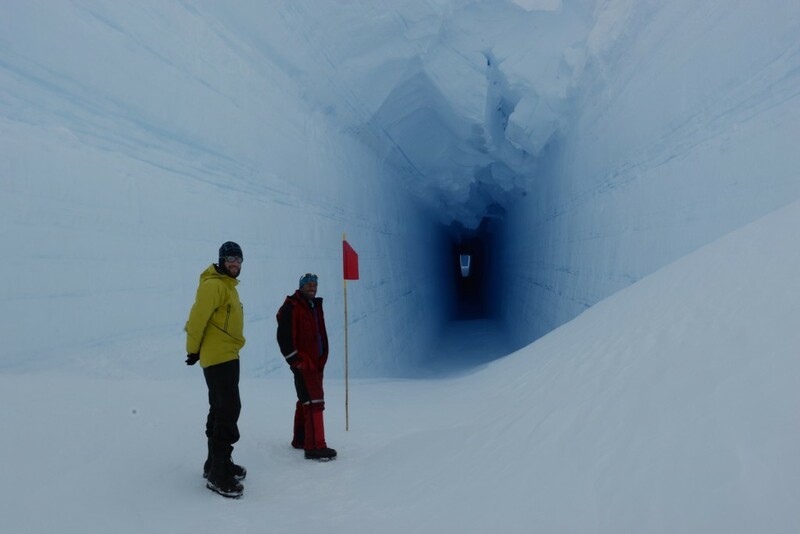 To our surprise, we stumble upon a crevasse more than 500m long, 10m wide and 20m high. Moreover, we can safely descend through the apex of the crevasse to discover its vastness. Truly a magic moment! Thirty-six hours later, and thanks to antifreeze, the drill restarts. This small technical incident pushes us to work the next couple of days through the day and the night (under the sun at 3am is rather special) and we take turns in operating the drill. We reach a depth of 107m, not far from the 155 meters needed to reach the bottom of the ice shelf, but the brittle ice makes progress very difficult. Nevertheless, this is the third core of the (short) season, and as valuable as the previous ones. We can clearly identify every single ice layer over 200 years as well as the surface melting history. 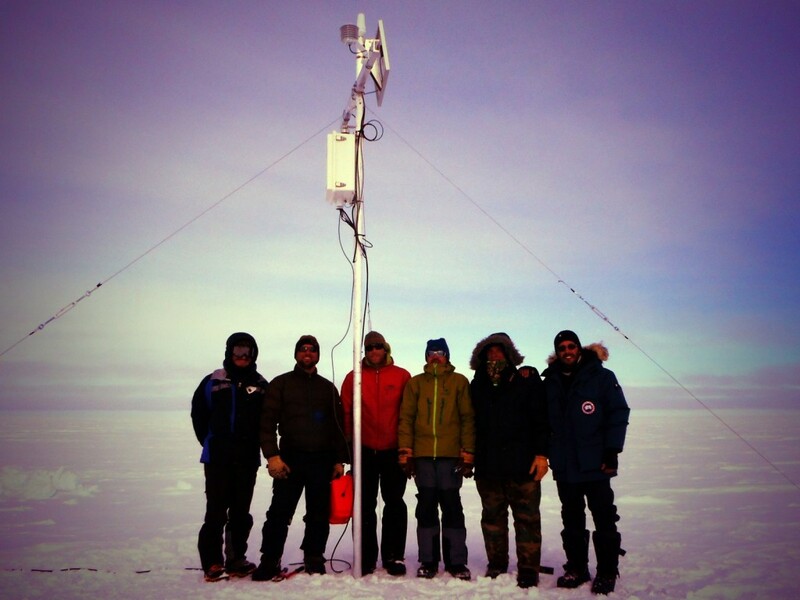 Before leaving back to the base, we finish the installation of the famous Tweetin’IceShelf project (http://tweetiniceshelf.blogspot.com); a project also presented at the EGU General Assembly in 2015. We deploy two GPSes on the flanks of the trench and one in the center. These are simple GPS systems that record their position every hour. They are named GPS CGEO (from Cercle de Géographie et de Géologie de l’ULB) and GPS CdS (from Cercle des Sciences). In the center of the trench, the ApRES is installed which measures once a day the radar signal through the ice. All systems will be effective throughout the Antarctic winter. Data are sent via Twitter to be followed by a larger community. Just follow the @TweetinIceShelf on Twitter. You will not be disappointed. 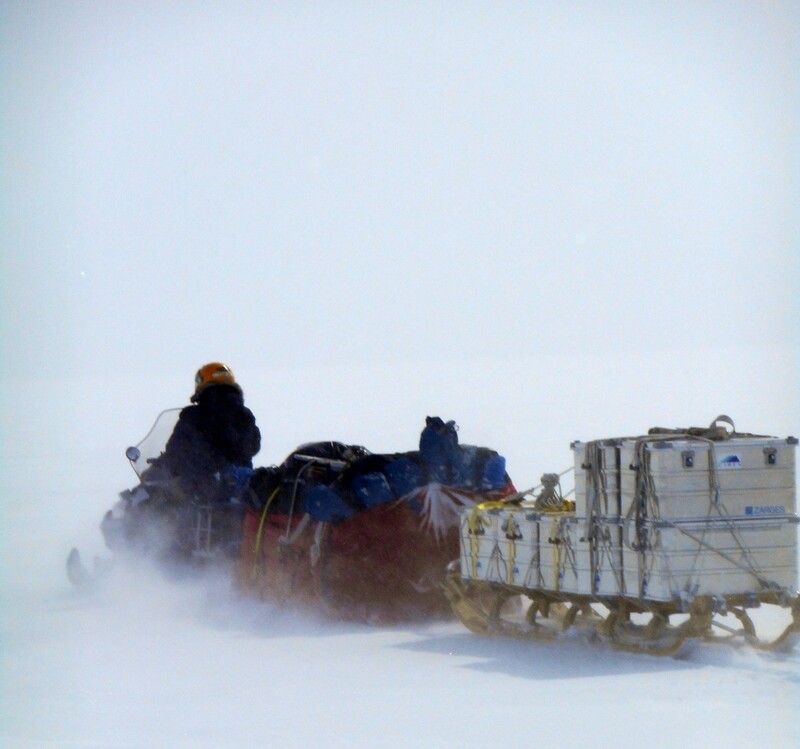 It’s time to go back to the station, which is reached after 20 hours of travel across the ice shelf and the coastal ice sheet. Over 2 days we will be at Cape Town and we have to clean up everything for the next field season. I know it is my first time to Antarctica, and as most first-timers, an unforgettable experience of vastness, whiteness, silence, laughter, hard work and fun. When I board the plane I feel delighted and fulfilled and ready to find back green landscapes and city soundscapes in less than ten hours. Brice Van Liefferinge is a PhD student and a teaching assistant at the Laboratoire de Glaciology, Universite Libre de Bruxelles, Belgium. His research focuses on the basal conditions of the ice sheets.